I wanted to give a shout out to an LA startup that I feel is doing incredibly well – and they’ve killed it at the two events that they’ve been involved with. That startup is SquareShare, and they have some really cool technology. In a nutshell, SquareShare allows anyone to promote their offline content (think flyers, magazine & newspaper content) directly into the social online world (twitter, facebook, etc.) to facilitate meaningful conversations. They use QR codes, and have built technology that allows anyone with a smartphone to share items that have been tagged with one of their QR codes. 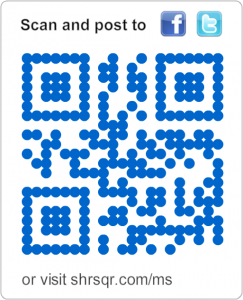 A QR code is basically funky looking barcode that holds information inside it. When you scan the barcode, you unlock the contents and that’s where the magic begins. Anyway, I just thought that I’d share some cool tech with everyone. I’ve embedded a squareshare code directly in this post. If you have a smartphone, please feel free to scan it and share it! NOTE: Full Disclosure – I serve in an official capacity as an advisor to SquareShare.